Interior Bowl Dimensions 14.5" X 16.88"
It is rare to find a double-bowled kitchen sink that has ‘efficient ergonomics’ written all over it. Especially with all such sinks being mixed between their counterparts that can be termed to be ‘mediocre.’ To help you know more about one such efficient sink, we present to you our Ruvati RVM4350 Kitchen Sink Double Bowl Review for your convenience. Ruvati Sinks like this double-bowled sink are well-known for their impressive functionality. Ruvati Kitchen Sinks are wide, and both bowls have a large depth. The double-bowl design works great for washing different dishes at the same time. For example, one bowl can be used for soaking while the other can be used for washing. Another perk of having Ruvati Undermount Sinks such as the RVM4350 is that they are corrosion resistant and easy to clean. The RVM4350 is also easy to clean, making it easy to maintain. Both bowls of this sink have their drains in the middle and are big enough to drain a lot of water. 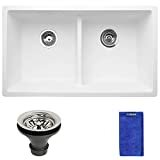 Now let us guide you further into the sink’s specifications in Ruvati RVM4350 Kitchen Sink Double Bowl review of ours and help you understand what makes this kitchen sink so special. The RVM4350 has two bowls in it. The bowls can be used for dual-purpose. 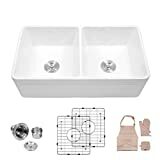 Both bowls are of the same dimensions, with both of them being 14.5 inches wide and 16.88 inches long, and both of them being 8.5 inches deep, the sink offers ample space to hold dirty dishes, and wash them without having to worry much about spilling water everywhere. 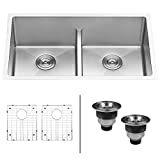 This double-bowled sink is made of 304-grade stainless steel, a strong and durable metal made of chromium and nickel that allow it to be very resistant to corrosion. 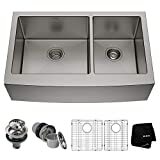 It also has a luxurious satin finish that also makes the entire sink smooth and easy to clean off impurities. This is capable of being as silent as possible. The padding eliminates most of the annoying and unwanted pitter-patter of water dropping from the faucet. 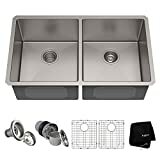 This allows you to have a nice, quiet operating of the sink without having to be annoyed by the sound the water would make as it keeps falling on the sink. 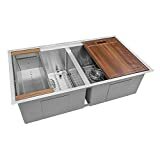 As seen in our Ruvati RVM4350 Kitchen Sink Double Bowl review, the RMV4350 of the Ruvati Kitchen Sinks series is a kitchen sink with hardly any drawbacks. Its double-bowl system allows it a dual-purpose, and it is made of durable materials, along with a finish that gives it a luxurious look. The bowl also requires little maintenance to keep it shining and in a working condition. 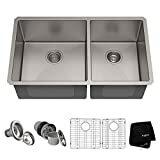 In this Ruvati RVM4350 Kitchen Sink Double Bowl review, we hope you have had a clear idea of the features that make this kitchen sink stand out from other sinks you would normally see in shops. For those who expect to own a kitchen sink that is ergonomically efficient and requires little maintenance for functioning, this sink might be the right choice for you.